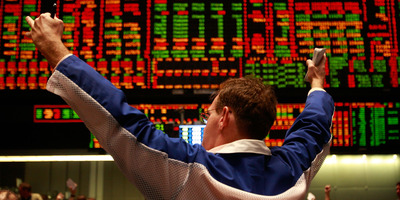 Getty ImagesA trader signals an offer in the Standard & Poors 500 stock index futures pit at the CME Group February 20, 2009 in Chicago, Illinois. The US 10-year yield topped 290% after CPI was hotter-than-expected. Traders have been selling Treasurys amid fears the Fed will hike rates more aggressively than previously anticipated. US Treasury yields are spiking after Wednesday’s consumer price index report showed inflation rose quicker than expected in January. The report released by the Bureau of Labour Statistics showed consumer prices jumped 2.1% year-on-year in January. Core CPI, which strips out volatile food and energy costs, rose 1.8%. Wall Street economists were expecting respective prints of 1.9% and 1.7%. The nearly 7-bp rise in the 10-year yield has the benchmark yield at its highest level since January 2014 as traders have been selling Treasurys in droves amid fears rising inflation will cause the Federal Reserve to raise rates quicker than anticipated. At its February meeting, the central bank said it expected to raise rates three times in 2018. However, many market participants now think there could be a fourth hike this year. Wednesday’s selloff has had little impact on the yield curve as the 2-10-year spread trades little changed near 73 bps.